Some people change the course of your life. My midwife Christine Shanahan, who passed away last month, changed my life, and the lives of literally thousands of mothers, babies, fathers and families. I met Chris in Melbourne, where we were living at the time, at our friend Sandy’s first labour and birth . Like all births (and babies), it had its own unique character. Sandy had five older brothers, and one of them came to support her in labour. Very willing, but a little unsure of his role at a homebirth, he ended up mowing the lawns—and formidably protecting the space at the same time. Through the labour, as we wrung many soothing hot towels together, I was reassured by Chris’ calm demeanour and gentle presence. Both my partner Nicholas and I were fresh from our training in family practice (GP) obstetrics, so that we watched Chris’s unobtrusive, careful work with professional eyes as well. Sandy birthed her baby beautifully in the water, and we later witnessed Chris’s wonderful postpartum care for the new family. 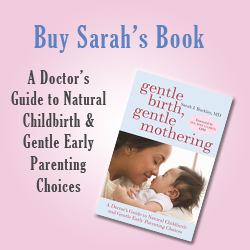 When we came to select a midwife for our first baby (and intended homebirth), it was a very easy decision. We also engaged experienced homebirth GP Dr Peter Lucas just in case our baby needed medical care. (Possible emergencies were at the top of our minds after our hospital training.) We also had a second midwife, along with four possible support people, including my sister coming over from New Zealand. As it turned out, I gave birth with just Nicholas, myself and Chris, who walked in as I was starting to push. I remember vividly the relief and safety I felt in that moment, as I looked in her eyes. Peter arrived just as Emma was emerging, posterior and 5lb 1oz at birth. We were immensely blessed that Chris and Peter trusted and supported us to care for our small, ahead-of-schedule baby at home. Amongst the postpartum visits and stellar care, we learned that Chris, who had been adopted, had recently met her birth mother. She told me that she thought her passion for keeping mothers and babies together came from her own early experiences. Somehow our journeys seemed parallel at the time, forging new family ties. She offered to ask another new mama for donor milk if Emma needed it, and she was sweet and open with our preference to “see how we go” with my milk supply, which came through soon after. Through two more pregnancies, and the beautiful births of Zoe and then Jacob, I spent many hours with Chris. She was always generous with her time, addressing our questions and concerns with wisdom and knowledge. Sometimes our pregnancy visits lasted 2 hours. We judged her care to be vastly superior, compared to any hospital or medical care that we had seen. I was also very aware, from my hospital training and experience, of the extra ease and pleasure that I gained through birthing at home with Chris’s support. This included Zoe’s posterior labour and birth, and Jacob’s way-past-due-date arrival, and the lotus births of both babies. After this we moved north, so we missed having Chris’s TLC with our fourth baby Maia. We kept in touch over the years, and I sent her my Gentle Birth, Gentle Mothering books, with deep appreciation for her central influence in my family, life, and work. Last time I asked, she told me she had caught more than 1500 babies, including babies born at home and in hospital. She was always on my Christmas card list: from my perspective Chris was family. We shared her delight with the birth of her grandson, and the nourishment of her family. Chris had some health problems over her life. She died peacefully surrounded by her family. I’m writing this to honour not just Chris, but all midwives, and to sing the praises of “continuity of midwifery care.” Having one midwife giving care from pregnancy through to birth and baby is not just a great experience. According to the Cochrane collaboration, which summarises the best medical evidence, continuity of midwifery care reduces the chance of early pregnancy loss, as well as lessening women’s need for pain relief in labour, and enhancing her satisfaction with the birth, with no extra risks for mother or baby. And a recent study from here in Brisbane showed that midwifery care can also buffer against pregnancy stress. According to the World Health Organisation, midwives are skilled at “optimizing normal biological, psychological, social and cultural processes of reproduction and early life, timely prevention and management of complications, consultation with and referral to other services, respecting women’s individual circumstances and views, and working in partnership with women to strengthen women’s own capabilities to care for themselves and their families”. Kildea S et al. 2017 Continuity of midwifery carer moderates the effects of prenatal maternal stress on postnatal maternal wellbeing: the Queensland flood study. Sandall et al. 2015 (Cochrane Database Systematic Review) Midwife-led continuity models versus other models of care for childbearing women.